Ele era um dos melhores apps de smartphone para controle de alterações em viagens que utilizavam as reservas do sistema Amadeus (TAP, Latam, Qatar etc.). “After nine years and more than 50,000 users, it’s with great regret that I announce that on 31 December 2017, MyFlights will be discontinued. Our current agreement with Amadeus, the booking reservation system, comes to an end on 31 December 2017. Unfortunately, the new agreement doesn’t give MyFlights access to the data it needs to operate. New security procedures require approval from the booking agent before a booking can be accessed by a third party. As such, MyFlights would need a separate agreement with each and every airline or travel agent that a MyFlights user might book with in order to access their booking information. However we don’t have the resource to establish and manage many thousands of separate relationships. So from today, we have stopped accepting new account registrations and existing accounts can no longer upgrade their status. What will happen to my bookings? You can continue to use the MyFlights app and MyFlights on the web as normal until 31 December 2017. After this date, your existing bookings will no longer be monitored for changes and you won’t be able to add new bookings to your account. You will be able to view your existing bookings until 30 June 2018, at which point your account and all associated data will be permanently deleted. Although we’re devastated to be discontinuing MyFlights, the name will live on in our new tool for travel agents. Designed to help travel agents keep their customers up-to-date with their travel, MyFlights Travel Agent notifies you and your clients about any changes that might affect their trip. To find out more about this service and how we can help you deliver the ultimate travel agent experience, please get in touch. 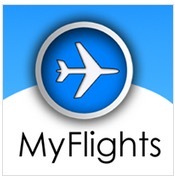 Finally, on a personal note, I just wanted to say a huge thank you for choosing MyFlights. I created the app nearly a decade ago to monitor my bookings, and added it to the App Store in case anybody else might find it useful. Seeing the app grow over the years has been one of my proudest achievements and I have been overwhelmed by your enthusiasm and support. It’s been incredible hearing on a daily basis how MyFlights has become an essential travel tool and helped you avoid some sticky situations. Thank you again, and safe travels. Triste notícia para quem costumava usar esse app com frequência. Alguém recomenda um app substituto? Uso o Tripcase mas acho ele falho. Muitos voos que sofrem alteração não são nem informados nem atualizados. Isso com antecedência, pois vi gente falando sobre alterações no mesmo dia, o que nunca ocorreu comigo. Usava muito o TripCase e substitui ele pelo App in the air. Utilizo a versão paga. Também uso o App in Air pago, só não consigo adicionar viagens de terceiro que contenha um voo em comum com meu. Ele tenta adicionar a uma viagem existe. Awardwallet, no solo me informa de las alteraciones sino que lleva el control de los programas de millas. Pague los U$5 anuales en agradecimiento a que gracias a la app me entere de una alteracion de Latam, que la empresa no me habia infromado y me permitio hacer un cambio de vuelo por uno mucho mejor del que tenia. Há algum app que aceita os códigos de reserva da GOL? Em tempo, para os voos Oneworld, uso o CheckMyTrip. Também tenho essa dúvida, nenhum desses app consegue acessar voos Gol!